Our Rosso Corsa sock was the basis for the Free 9 Sock, but we’ve added a new mesh construction to the cuff to make it a bit cooler for summer. The graphics look great with any Castelli product, but they were specifically designed to match the new Free Jersey and Free Bibshort. Cycling socks have technical properties to provide warmth, wick away moisture and give a bit of extra padding where you need it while riding. Any cyclist will benefit from cycling-specific socks – they’re designed totally around cyclists’ requirements, so every cyclist will find them more comfortable than regular socks. Some cyclists like long socks, some prefer ankle socks, so the choices reflect this. There are also different socks for summer and winter. You can even get totally waterproof socks, for warm, dry feet when it’s teeming. 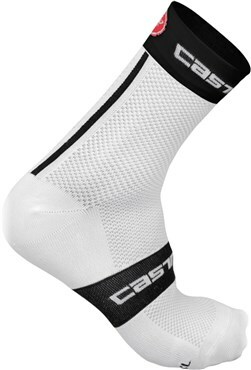 More socks – you need more than one pair of cycling socks, that’s why they’re often supplied in multipacks. Wearing the same socks more than once in cycling, as in real life, is a total no-no. Cycling shoes can have quite a tight fit, so especially with winter socks, make sure you leave enough room for your socks to avoid discomfort.